The Ríos del Páramo al Valle project operated from 2012 to 2015, applying a participatory planning process developed by SEI called robust decision support (RDS). The project integrated contributions from academic institutions and Corporaciones Autónomas Regionales (CARs), the regional water governance agencies. The goal was to help create regional and national leaders with long-term capacity to manage and plan the development of watersheds while integrating climate considerations. Working in close coordination with the technicians and decision-makers from the CARs, the project evaluated and prioritized a viable set of adaptation alternatives that can reduce climate vulnerability, laying a foundation for sustainable development and the conservation of vulnerable ecosystems. 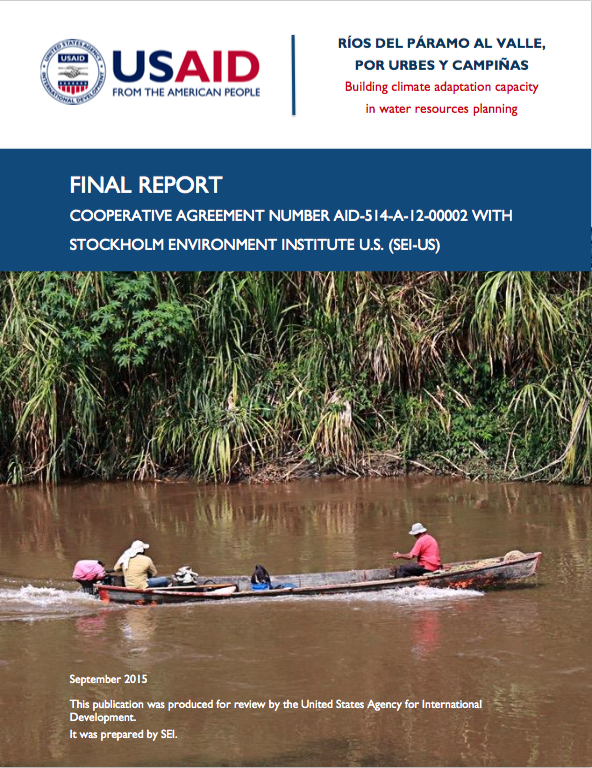 The report* decsribes the Robust Decision Support methodology and demonstrates its use to support adaptation capacity building in watershed management capacity in four context-specific case studies. The use of WEAP and other tools to aid water resource management outside of the original project case studies is also demonstrated. Lessons and recommendations that are relevant to water resource planning, both in Colombia and elsewhere, are provided. The approach and results of the monitoring and evaluation of the project are also reviewed and discussed. *download from the right-hand column or via the links provided under further resources. An overview of the methods, the case studies and the main lessons learned are provided below. See the full text for much more detail. The Rios del Páramo al Valle program applied a participatory planning process referred to as Robust Decision Support (RDS) to clarify the steps required to develop useful information about watershed adaptation. The practice of RDS is based on a theoretical decision making under uncertainty framework referred to as Robust Decision Making (RDM), and is described in detail here. The program generated further impact by promoting the use of WEAP and other program tools in the planning of watersheds outside of the original project case studies. At different points in the RDS Preparation Phase, gender considerations were mainstreamed (see page 30 of the report). Together these efforts led to greater awareness of gender issues among project partners and to greater participation of women on project activities. By interacting with CARs, it was clear that the rich legal framework for watershed development in Colombia can be overwhelming, resulting in local autonomous authorities often relying upon external consultants to ensure their compliance with national level requirements. This program’s WEAP-based RDS approach sought to enhance CARs participation in watershed development through capacity building activities that led to them obtaining and understanding the building blocks of watershed adaptation analysis. Identifying the decision space, mapping the regional actors, defining the key scenarios of uncertainty and action, and building tools within the first year of the program gave the initial baseline information. During the second year, the focus was on generating a large dataset of cases, defined by external pressures such as climate and by available adaptation options, in order to understand the key locations of high climate vulnerability and to discover key adaptation options. Sharing this information in useful and dynamic graphs provided a vehicle to communicate complex information with decision makers at the regional and national levels. The complete process responded to the needs to incorporate regional knowledge from actors into decision making about water management. Each case study, alongside specific adaptation options, lessons learnt and major accomplishments, is described in detail in the report (available to download from the right-hand column of this page). The lessons learnt and outcomes discussed below represent a synergy of learning from the individual cases. Lessons learned at different levels of the project suggest possibilities for potential improvements. These are provided in detail from page 82 of the report, and are summarized here. A focus on building the capacity of early career young professionals is useful. Some have taken the skills needed to implement the WEAP-based RDS approach and applied them to other similar activities beyond those undertaken as part of the project. In addition, they have established professional and inter-personal connections amongst themselves which creates a nascent professional network working on climate change and water management in Colombia. As these young professionals advance along their career trajectories they will bring the experienced gained on the project with them to increasing high levels of engagement and responsibility. Working with universities creates legacy institutions. Universities increasingly need to justify their research through collaboration with actual managers and decisions-makers. In Colombia, a number of CARS and other water management entities have developed very strong and productive relationships with universities. Through continuing these trends, universities can play the role of legacy institutions for the learning achieved during project implementation, particularly if they capitalize on opportunities to develop classroom and research opportunities for students on the subject, as all of the project’s university partners have done. As CARs are key to on-the-ground change, their engagement needs to be strengthened. Experiences gained during project implementation suggest that the manner in which CARs engage in the application of the WEAP-based RDS process needs to be re-evaluated. In particular, technical staff within the CARs need to be more active participants in the process so that the technique can be taken up instead of simply being understood. This would require more substantial and sustained capacity building directed towards key technicians with the CARs, and a commitment from their management to allow these staff to engage in the process to a much higher degree, akin to the way the integration of GIS into the internal capacity of the CARs evolved a decade or so ago. Constructing a watershed model takes work; opportunities exist to streamline the process. The work required to construct an integrated hydrologic/water resources model such as WEAP is not inconsequential. A large part of the effort is associated with gathering and processing the spatial information and time series data required to construct a model. SEI has developed a set of tools and techniques for accomplishing these required tasks, which are detailed here. There is a real opportunity to automate some of these tasks within the software itself in order to facilitate the model building process, which would aid the uptake of the tool within the CARs. The development of a community of practice related to watershed modeling is key. It should never be assumed that the development of a good watershed model will ever become a push button exercise. Such a level of automation would never foreclose opportunities for individuals with extremely relevant local knowledge to contribute useful and important insights to the model building process. Gaining access to the collected experience/insights held by these individuals would be greatly facilitated through the creation of a WEAP/RDS community of practice. In some respects the emerging network of young professionals associated with the project already operates as an informal community of practice. Formalizing these relationships through on-line platforms or periodic user conferences could improve the quality of information exchange and the efficiency of the model building process. Care needs to be taken to characterize uncertainties created by a lack of monitoring data. While Colombia is by no means the worst case in terms of the availability of the information required to construct and calibrate a model such as WEAP, there are gaps in the existing data and constraints in the ability of technical analysts to access what is available. While progress could be made in improving access to existing data, to which the development of IDEAMS National Water Information Platform is contributing greatly, Colombia, like all parts of the world, will never possess all of the data required to construct a perfect model. As such, greater care should be taken in the future to develop techniques to convey to decision makers the uncertainty in model output stemming from incomplete model input data. Socio-economic metrics need to be included in the evaluation of adaptation options. During the implementation of the project, a great deal of time was spent characterizing the vulnerability of the current systems within the project watersheds. From this baseline vulnerability assessment the ability of specific management responses to reduce the level of vulnerability with respect to these current conditions was assessed. The exercise made it possible to analyse how specific adaptations could improve future levels of performance with respect to metrics, such as the ecological condition in key river reaches, and to compare these improvements across the suite of proposed actions. The comparison across potential management actions, however, requires that some consideration be given to the financial costs and benefits associated with each evaluated course of actions, along with some consideration of metrics related to social equity. In the future, these sorts of indicators should be more fully evaluated as part of the implementation of the WEAP-based RDS approach. Different ways of presenting model results to different audiences are needed. The use of WEAP within an ensemble of model runs, that generates a range of cases defined by different future scenarios and management responses, produces a large amount of data. One of the most challenging, and most exciting, parts of the RDS process is the development of data visualization tools that support participatory and dynamic exploration of these model outputs as part of a process of co-learning amongst key stakeholders regarding promising adaptation actions. During the project, the Tableau software was used to build these data exploration tools, to great success when the target audiences were technical partners and technical collaborators within the CARs. There needs to be a recognition, however, that non-technical audiences, specifically politicians and policy makers, may not have the time to dedicate to understanding expansive data exploration. Different communications approaches are required to transmit learning about climate change and water management to these actors and more work could be done to identify the most promising communication techniques for each critical audience. The linkages between water and watershed planning instruments needs to be clarified. There are a number of mandated planning instruments of relevance to the water and watershed planning in Colombia. While there are practical reasons for keeping these plans separate, there is a great deal of overlap that must be recognized if the IWRM aspiration of integrated, multi-actor, multi-objective water management is to be achieved in Colombia. Key questions of information flows between the plans, and issues of subsidiarity, need to be clarified if these plans are to meet that objective. A strong case could be made that a consistent watershed model developed on a platform such as WEAP could provide a valuable shared foundation upon which individual plans could be constructed. Technical guidelines associated with these instruments need to include climate change. More important than mandating specific climate change analytical protocols for the planning instuments is whether climate change considerations can be gradually incorporated within the steps described within associated guidance documents. In particular, innovative analytical tools and participatory processes developed and tested at the local watershed level, such as those described in this document, need to be encouraged and accommodated. Co-learning between local level experience and national level policy is nascent. In the last months of the project, SEI and its partners organized a set of dialogues with national level actors working in the field of water and watershed management and climate change around the activities carried out in each of the project watersheds. The forum provided an opportunity for the experience gained by project partners at the local level to be shared with those responsible for setting national level policy. The reaction was extremely positive. One consistent theme from the dialogues was that learning accomplished at the local level can usefully contribute to the national level discourse on appropriate policy responses to climate change. The Ministry is hungry to know about these experiences. Still the connection between bottom-up and top-down learning is nascent. Another theme of the dialogues concerned post-conflict Colombia, where natural resources and the environment are playing important roles in the emerging terms of the peace agreement. While nascent, the connection between national goals and local experience needs to be cultivated by connecting staff within national level institutions with colleagues working in local watersheds. IDEAM play a key role in efforts to consider climate change within IWRM activities. One key actor in the strengthening of these connections between levels is IDEAM. As the organization with the mandate to generate and supply information relevant to local water and watershed planning, SEI and partners took pains to include IDEAM in the activities undertaken at the local level. A principle example is the organization of a climate scenarios workshop, at which staff responsible for developing national scale climate projections for Colombia had the opportunity to hear about the needs local water managers have for climate projections with an appropriate spatial and temporal resolution to support watershed planning. The workshop connected both sets of actors with colleagues within the National Center for Atmospheric Research in the United States who have a long experience of downscaling large-scale GCM output for use in watershed level models such as WEAP. A second example stems from the use of WEAP in the Alto- Magdalena region to support the development of an ERA (Estudio Nacional de Agua) in the Huila Department. The ERAs are an IDEAM initiative designed to develop a disaggregated set of indicators that can serve as a baseline for the various water and watershed plans mandated in Colombia. Based on the local experience in Huila, IDEAM is now planning to include WEAP in the National Water Modeling Center it is developing to support the development of ERA and other watershed level investigations. The connections forged with IDEAM pertaining to the WEAP-based RDS method during project implementation must be cultivated. The creation of capacity to secure funding for promising adaptation actions is required. While the project accomplished much in terms of building the capacity of local partners to introduce climate change considerations into water and watershed planning, and contributed usefully to emerging national level discourse on the subject, the fact remains that participatory processes, analysis and plans will be needed to motivate real, on-the-ground changes that can reduce the vulnerabilities created by climate change. Funding for such activities may be sourced from a number of international, regional, and national funds, but these require demonstration that any specific action offers climate change adaptation capacity beyond the normal set of benefits that would accrue from any particular project. This is a high standard, and one that is increasingly based on some level of technical analysis. SEI has deployed in-house staff with high levels of experience and knowledge of emerging climate adaptation funds to help argue how the WEAP-based RDS approach can be used to strengthen adaptation plans and therefore to secure necessary adaptation funding. This argument needs to be refined and transferred to local water managers so that they can translate the promising actions highlighted in the Results section of this report into on-the-ground projects. As with any new challenge, Colombia’s journey towards a full consideration of the risks posed by climate change and other uncertainties to water management will move along a series of steps. While a decade or so ago the global water management community was largely unaware of these risks, represented by the ground floor of ‘unconscious incompetence’ (see Figure 20, below), when the current project was initiated the Colombian water management community found itself on the first step, that of ‘conscious incompetence’ - there was a general awareness of the problem but little resolution on what should be done. The efforts, undertaken with partners in the project watersheds, was an attempt to move up to the level of conscious competence, where actual approaches for responding to the challenges posed by climate change were understood and accepted as useful. This has been accomplished, which for a project where capacity building was the primary objective, constitutes an enormous success. Moving to the next level of ‘unconscious competence’ is still a work in progress (Figure 20). What will this look like? It would see the agencies and stakeholders involved in implementing Colombia’s IWRM aspirations actually integrating climate change considerations into their normal workflows and discussions. More specifically, it would see the WEAP-based RDS approach being seamlessly integrated into the planning and decision-making processes underway in Colombian watersheds in response to clear guidance from national policy makers that makes this sort of effort mandatory, rather than discretionary. Once experience is gained along these lines, Colombia will be primed to move to the final step of ‘reflective conscious competence’ whereby consensus is reached around the best courses of action to reduce water management vulnerability to climate change and resources can be mobilized to implement these actions on the ground. Maintain presence at the CAR to support the integration of the WEAP-RDS approach into standard workflows, e.g. through assisting in-house staff to define work plans, monitor progress and solve problems that are encountered. Plan regular meetings with CARs Directors to help them become conversant with the approach and understand how it facilitates the consideration of climate change within the standard CAR’s functions. Generate opportunities for exchange of ideas about climate adaptation at the watershed level to support the development of a community of practice that can facilitate knowledge exchange between watersheds where the approach is being applied, and across policy scales. Draw stories of change to highlight the impact of climate adaptation in terms of planning before and after to, in the words of one project partner, "give an answer to the community as to whether a project is viable or not in terms of its climate adaptive capacity"
​Make water central to the national debate: Colombia is rich in water resources with 6 times more water supply per capita than any other country in the world, and 3 times more than others in Latin America (Blanco, 2008). However, some rivers have been greatly altered and despite an appropriate legal framework provided by the 99 Law of 1993 and the creation of the CARs, problems remain. The largest water user in the country is the agriculture sector with 54%, followed by the urban sector with 29% and industrial sector with 13%. It needs to be recognized that in spite of the rich endowment of water, Colombia must manage its resources in order to provide water of sufficient quantity and quality to support these activities. All the more so in post-conflict Colombia, where improving rural livelihoods will be critical. Recognize how land use planning is going to impact on water management: Land use and land distribution is at the core of the conflict in Colombia and it is also at the core of the peace process. Colombia has 114 million hectares, and could use 20 for agricultural production. However, the country is using only using 5 million hectares. 40 million hectares are being used to support extensive cattle ranching, which could be accomplished on 5 million of hectares if livestock production systems were improved. There are 35 million hectares that could be used for other activities, such as the conservation of ecosystems that underpin water resources in the country. Among the proposed activities in the post-conflict era are actions to coordinate land use planning. This highlights one of the key challenges for water management, which is to recognize its close relation to land use planning. Connect program themes to realities of the peace process in the country: All regions in Colombia are witnessing the peace process and are expectant as to its outcomes and final resolution. In this particular case, connecting the symposium themes of water and adaptation to the peace process generated the opportunity to increase awareness about the importance of watershed planning for more sustainable progress. The management of land and water resources must be a focal part of implementing the peace. Prepare a clear, written articulation of the priorities and how these have been developed: Once the importance of water and watershed management is firmly established in post-conflict policies in Colombia, the stage will be set to begin the sorts of actions and adaptations identified through the implementation of the WEAP-based RDS process as implemented by local CARs. Templates should be developed which clearly articulate how these actions fit within national policies and are justified in terms of the concept of additionality required to secure adaptation funding support from various sources. Maintain contact with national government focal points for adaptation funding: The national focal points for the various sources of adaptation funds are key actors with whom relationships must be developed and maintained. As CARs develop proposals for water management adaptations to climate change, grounded in emerging national policies and in the implementation of peace agreements, these focal points should be briefed on the proposed actions and the manner in which the WEAP-based RDS process justifies their selection for funding support. If these best practices are followed it should be possible to (i) enable CARs and other local water management institutions to identify promising adaptation actions to reduce the vulnerability of watersheds to climate change and other uncertainties; and (ii) connect these actions to emerging national policy initiatives in a post-conflict Colombia in a manner which motivates financial support from sources of climate adaptation funding. Read a blog on lessons from the project: "Water, climate change and peace: lessons from 3 years in Colombia"